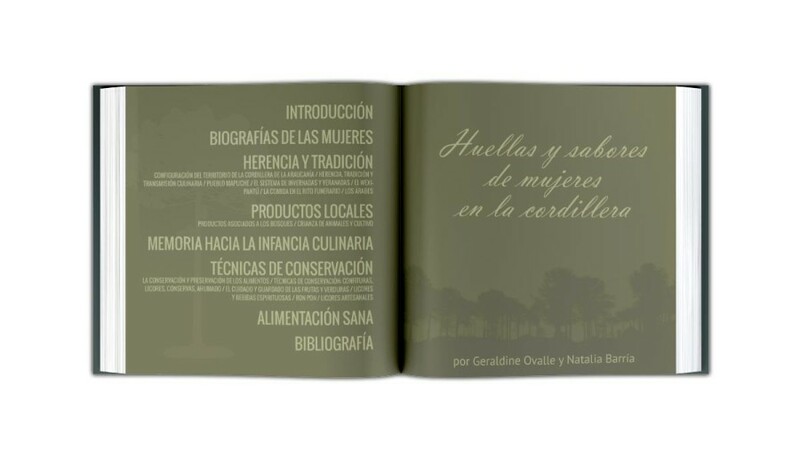 I was contracted by Geraldine Ovalle and Natalia Barría, two winners of the Regional Fondart in 2014, to provide the design for their book, Huellas y sabores de mujeres en la cordillera. The idea was for this particular book to be the first of three volumes, each of which would cover a different sector of the Araucanía Region of Chile: Mountains, Valley and Sea. The format of the book is a special 200mm x 200mm, as requested by the authors, and was designed using Adobe InDesign CS6 and Photoshop CS6. The book has a total of 68 pages, including: front and back covers, introductions by the authors, a photo index of participants, and a photo page dedicated to each participant, displaying their business and products. The book was designed around a largely green color palette, specifically using a dark green (#2d342d) and a lighter variation (#d7daa1). Instead of a more traditional Table of Contents, I opted for a more minimalist and modern design, showing the chapter titles in a large font, with any sections in that chapter appearing in a smaller text below. The tree illustration in the background is of an araucaria araucana, a highly symbolic tree in the Araucanía Region of Chile. Though the book consists primarily of an investigation, there are also several pages of photos. 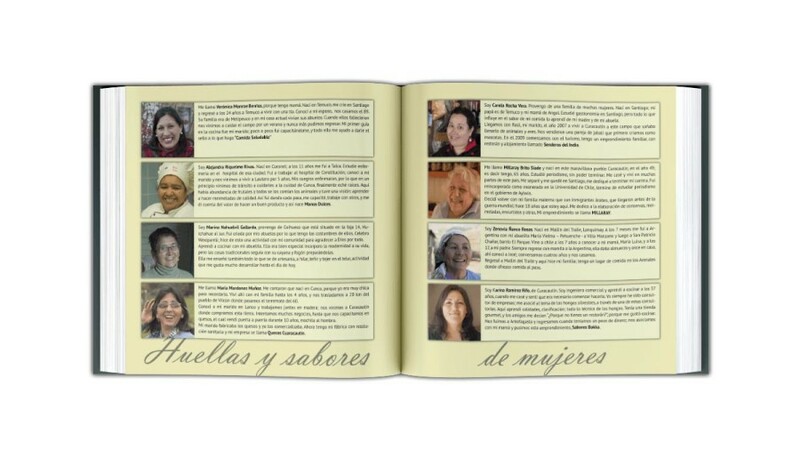 The bio section of participants has a photo of each person along with a brief description of how they became involved in gastronomy and the name of their current business or product. 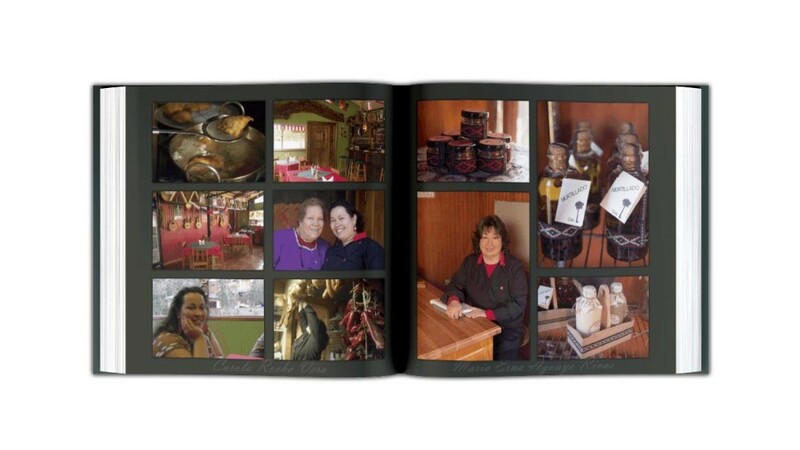 In addition, each interviewed participant has a full page of photos dedicated to their business and products. The photo page has a dark charcoal background (#2c2d28) and the photos have a small shadow border. 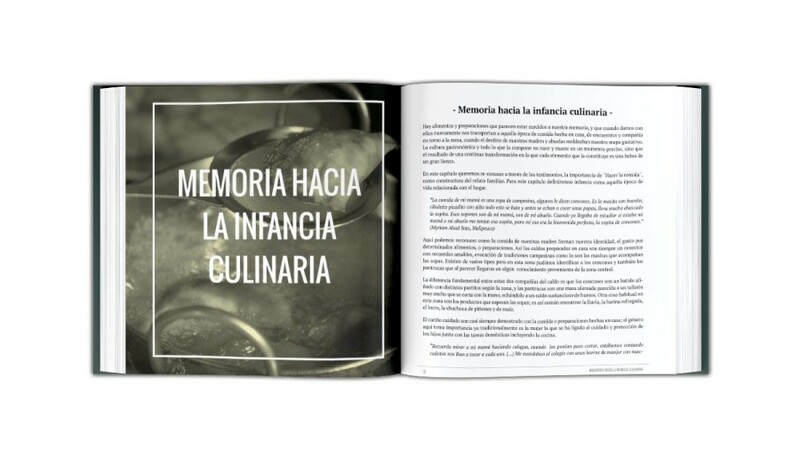 The book contains the results of a long investigation by Geraldine Ovalle, a gastronomy professor and Natalia Barría, an anthropologist. The results span a total of five chapters. To break up the monotony of white pages with text, faded symbols were periodically added to the background. Great attention was paid to the selection of fonts, line spacing, etc. for this project, to provide for easy readability. The fonts used in this project were Oswald (Cover and Table of Contents), PT Sans (Bio Pages), PT Serif (book text), and Vladimir Script (cursive fonts used on bio and photo pages). The main text – PT Serif – was set at 10pt, with a line spacing of 13.5pt to aid in readability. 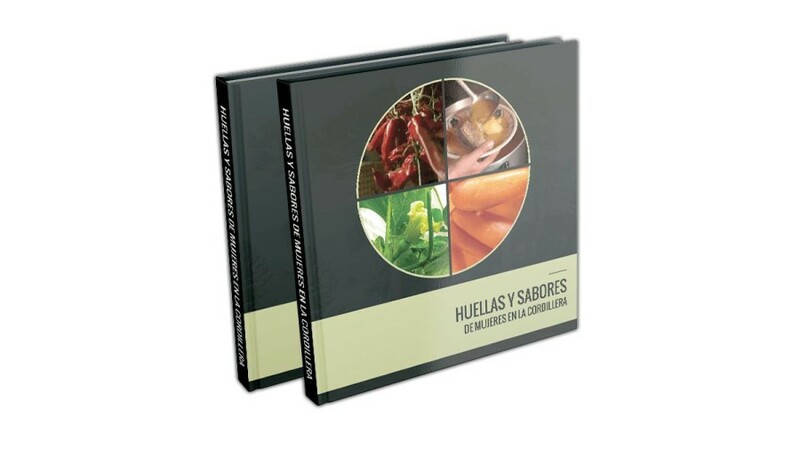 The book Huellas y sabores de mujeres en la cordillera was sent to print at the end of October 2014 with a first run of 250 copies. 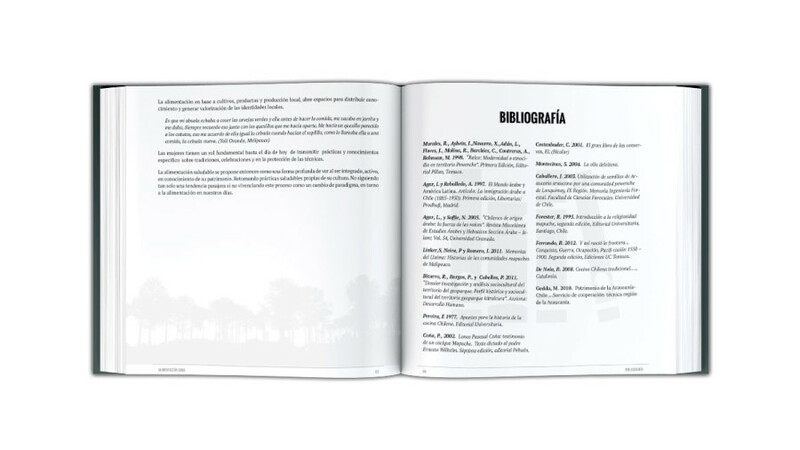 After the launch of the print version of the book, an e-Book was developed to increase publicity for the project. It is a faithful copy of the original book, and was created in EPUB and MOBI formats in order to reach a larger audience. It is a simply-designed book with a focus on being easy-to-read. The e-Book was designed mainly using Photoshop, Calibre, and Microsoft Word.